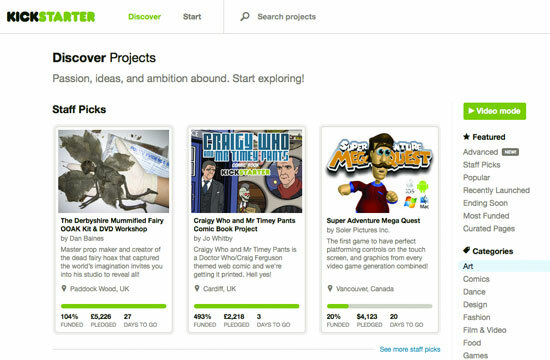 If you’re running a Kickstarter campaign, it behooves you to create as much identification with your effort as possible, to engender the sentiment that “we did it.” An easy way to do this is to build loyalty and association the way that bands have been doing since the beginning of time: By offering t-shirts to your Kickstarter campaign backers as part of your Kickstarter campaign. Sure, when the campaign funds, you could go out and get a bunch of t-shirts printed, or painstakingly hand screen them yourself, and hand mail each one to your valued patrons. But that’s not why you’re on Kickstarter, is it? You’re on Kickstarter because you have something new to offer and should be spending your time focused on your thing, whatever that is. A good solution for this is to utilize the services of drop shipped t-shirt printers. Services such as Print Aura go above and beyond by offering a fully white-label, drop-shipped, branded experience for you and your patrons. Print on demand services like Print Aura print and ship under the auspices of your campaign’s brand featuring your as a logos and branding on t-shirt neck labels, return labels and packing slips. Patrons would contribute to your campaign as they normally would, and at the end of the campaign, a .csv file with the patron shipping can be sent to Print Aura who will print and ship them to your patrons within 3-7 business days. Since everything is under your brand your supporters will never know it wasn’t coming directly from you. A full spectrum of high quality garments and other products are available, so you can continue to offer brands such as Gildan, American Apparel, and other standards of quality your customers expect. The clear benefit is that the headaches of managing inventory, shipping, and logistics are gone. This eliminates the time previously spent on logistics and giving it back to you to do what you do best: Running a great campaign and making innovation happen. Put simply, print on demand services give you back more time to engage with your passion and focus on your core competencies, your competitive advantage, your creative output, and most importantly, building your campaign and product’s brand. Integrity is maintained to your brand with ease. The upfront risk is non-existent, as there are no upfront costs, no membership fees, and no order minimums required. Print on demand services employ direct-to-garment (DTG) printing, a solution that increases creative possibilities by removing any color restrictions and allowing for print on lights and darks. The greatest benefit in this case, besides the clear benefits of your time and resources not having to be devoted to dealing with printing and logistics, is the sense of identity with your campaign and brand offering t-shirts directly creates with your supporters. As Patrick Vlaskovits notes in his analysis of Facebook alternative Diaspora’s success on Kickstarter, offering t-shirts as part of the campaign resulted in an addition $48,550 for the category corresponding to t-shirts being offered for the supporter. But why is this? T-shirts give patrons something tangible they can identify with. They are exclusive and unique. They provide exclusivity via social capital and social proof. It’s a way for supporters to feel they were a part of what you’re creating which helps creates brand loyalty and the shirts they wear what end up being free advertising and increased brand awareness for your campaign. This generates multiplier effects by increasing the probability of spontaneous interaction and voluntary evangelism on the part of your supporters, who are eager to advocate on behalf of your innovation. They feel like they’re part of the club and have the cool factor. And besides, you never know. You might just have the next big thing. Those t-shirts could be collector’s items one day, for those who were there at the inception. Offering t-shirts through print on demand services like Print Aura is about as synergistic and effortless an avenue of marketing and raising brand awareness as your campaign could find. Simply send us a CSV of your orders when your kickstarter campaign is done and we handle the rest. Not a member of Print Aura yet? Signup today.